Designed for stitching such products as Leather Sofas, Car Seats, Shoes, Armchairs, Car Interiors, Leather Recliner, Cabin Upholstery, Tents, Sails, Harness, Tarpaulins, Safety Belts, Parachutes, Balloons, Industrial Bags, Boots, Boat and Furniture Upholstery, Sports and Camping Equipment, Sails, Tents, Car Seat Covers, Orthopedic Appliances, Suitcases, Knapsacks, and Outerwear made of extra heavy duty materials. Appropriate for use in Upholstery, Footwear, Leather, Canvas Industries. FOXSEW Cams Changed Multi Points Heavy Duty Zigzag Sewing Machine for Decorative Seams on Leather and Fabrics Upholstery, Heavy Duty Thick Thread 1-Step 2-Points Zigzag Stitch, Heavy Duty Thick Thread 2-Steps 3-Points Zigzag Stitch, Heavy Duty Thick Thread 3-Steps 4-Points Zigzag Stitch Sewing Machines. Changing Cams to make different points zigzag stitches, one step two points, two step three points, three step four points. 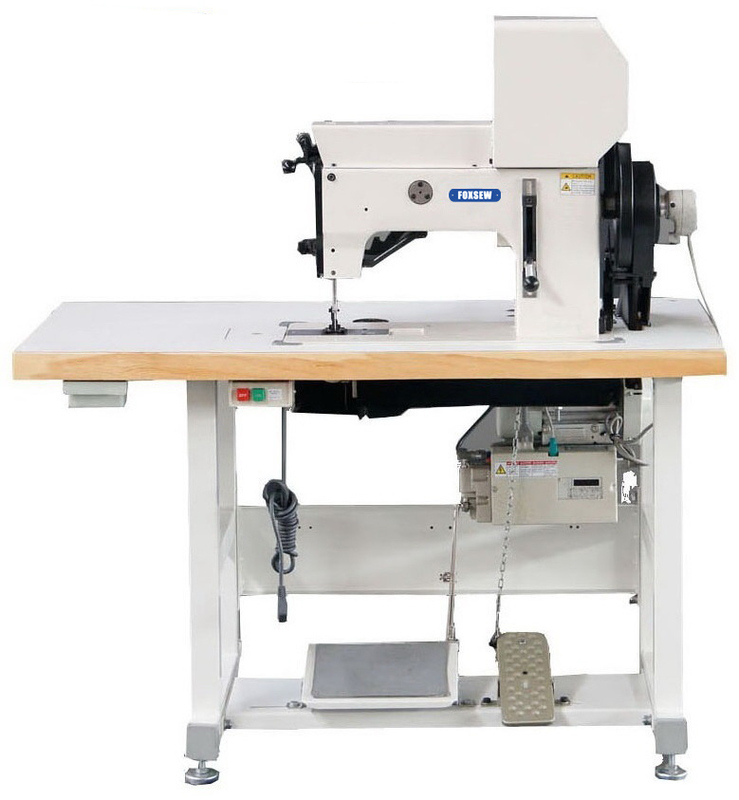 So this machine is also be use for Corner patching and webbing reinforcement on Sails, Parachutes, Marquees, Tents, and make zigzag decorative stitches on leather sofas, car seat covers, luggage, shoes, industrial safety product and leather goods. Large Barrel Shuttle Hook, Excellent Climbing Properties,Suitable for sewing heavy weight materials such as Canvas, Vinyl, Leather, Synthetics and Various Coated, Laminated and Rubberized Fabrics. Appropriate for use in Upholstery, Footwear, Leather, Canvas Industries. Features: The new design could realize zigzag sewing machine at many points. It adopts large oscillating shuttle hook, which could reduce the times of changing bobbin and realize sewing for thick thread. Thick material and decorating sewing. It is suitable for zigzag sewing, both cut sewing and decorating sewing of sofa, cushions, shoes, and leather products, such as the manufacture of leather goods, special textile, Sofa, furniture, Car Seat Cushion, Car Upholstery, tents, harness, saddles, and decoration industry. Looking for ideal Multi Points Thick Thread Sewing Machine Manufacturer & supplier ? We have a wide selection at great prices to help you get creative. All the ZigZag Machine are quality guaranteed. We are China Origin Factory of Cabin Upholstery. If you have any question, please feel free to contact us.